The Mob Museum in Las Vegas offers visitors an immersive, multi-sensory experience courtesy of a wide variety of audiovisual and interactive displays, several of which include Audio Spotlight directional speakers. The audio at the museum provides narratives detailing the history of racketeering and organized crime in the U.S. and throughout the world. The museum's technical implementation team installed six AS-24i speakers in several displays this year, including the museum's "Crime Lab Experience" and "Organized Crime Today" exhibits. 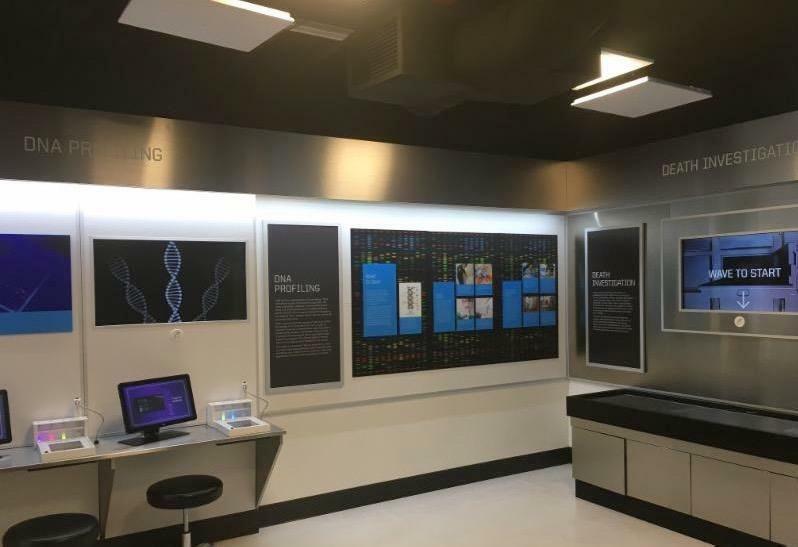 The Audio Spotlight system produces narrow beams of sound to inform visitors in the "Crime Lab Experience" exhibit about tactics that law enforcement uses in laboratories to discover and analyze forensic evidence. The museum's curators used motion sensors to allow each patron to start the videos, strategically positioned at the area where each beam of sound was focused. In the "Organized Crime Today" exhibit, the information broadcast via Audio Spotlight technology is part of an interactive, 17-foot-wide touchscreen wall that tells the story of 21st century organized crime rackets that span the globe and profit from a wide array of nefarious activities. The exhibit's touchscreen wall (photo below) is set up with four ceiling-mounted AS-24i Audio Spotlight speakers, each of which delivers a unique beam of audio to a separate, precise position along the wall. Each of the speaker's playback summarizes regionally-specific crime rings, allowing up to four patrons standing side-by-side, with each person hearing only the narrative of the speaker directly above them, and virtually no sound bleed from the other adjacent speakers. Audio Spotlight technology provided a perfect solution for the curator, who sought to have directional audio played reliably when patrons entered the space. The natural directivity of Audio Spotlight technology ensured that all sounds were contained to each exhibit area, and that no surrounding areas were disturbed. Learn more about new attractions that were added to the museum earlier this year, including the "Crime Lab Experience" and "Organized Crime Today" exhibits. For its use in museum settings, or any other similar usage, the flexible, self-powered Audio Spotlight directional speaker is a powerful tool, ensuring that any exhibit has its own isolated audio, captivating visitors with an immersive, personal experience, while keeping the surrounding area quiet. The Audio Spotlight is a revolutionary audio technology that creates sound in a narrow beam, just like light. Aim the flat, thin speaker panel to your desired listening area, and provide all of the sound and none of the noise.™ From museums, exhibits, and digital signage to retail stores and special projects, hundreds of companies have chosen this patented technology to provide high-quality, precisely controlled sound, while preserving the quiet. Holosonics is a proud partner in enhancing the experience for patrons who visit The Mob Museum in Las Vegas.